I swear this is the longest it’s taken for an Intel architecture to penetrate the market. We first met Nehalem on November 3rd, 2008. It came to us as a high end quad-core processor and took a full year to make it to more affordable motherboards in the form of Lynnfield. Even with P55 motherboard prices down at the magical $99 marker, Intel relinquished control of the $100 - $200 CPU market without a Nehalem to compete down there. 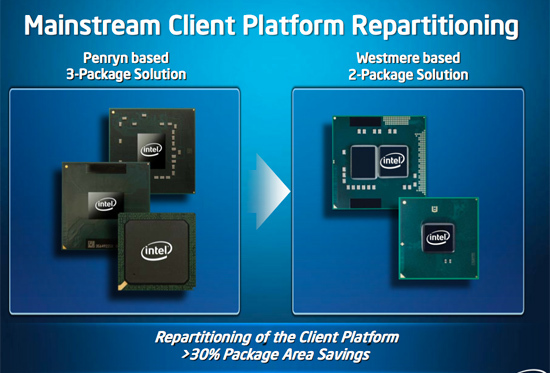 Instead we were left with a choice between Penryn, the update to Intel’s 2006 Conroe architecture, or Phenom II, AMD’s low-cost Nehalem competitor. The choice was simple. From $100 to $200, your best bet has been AMD. Either through aggressive pricing on quad-core CPUs or the L3-cache-less Athlon II line, AMD controls the $100 - $200 market. Today we meet Intel's first 32nm CPUs, codename Clarkdale, designed to specifically target that $100 - $200 market. Technically Clarkdale isn’t Nehalem, it’s Westmere. Take Nehalem, use 32nm transistors, add in some new instructions for accelerating encryption/decryption, and you’ve got the makings of Westmere. Clarkdale uses a dual-core Westmere and sticks it next to a 45nm Intel GMA die. That’s right, meet the first (er, second) Intel CPU with on-chip graphics. Next year we’ll see Sandy Bridge bring the graphics on-die, but until then we have Intel’s tried and true multi-chip-package to tide us over. We don’t get on-die graphics yet because Intel still hasn’t switched over to its make-everything-at-the-best-process-ever strategy. The 32nm fabs are ramping up with CPU production and the 45nm fabs need something to do. Nearly every desktop and laptop sold in 2010 will need one of these 45nm GMA die, so the fabs indeed have something to do. It’s not all rosy with Clarkdale unfortunately. Remember the memory controller that Nehalem so graciously integrated? Clarkdale kicks it off die again. The IMC is housed in the 45nm GMA die. It’s still on-package, but not on-die. The benefit is super fast memory access for the graphics core, but slower memory access for the CPU core. In fact, this is a derivative of the memory controller used in older Intel chipsets (e.g. P45/X48). The CPU connects to the GMA die using QPI, so bandwidth shouldn’t be as big of a problem. Latency is unfortunately hurt as a result. Access times can be longer than older LGA-775 processors thanks to this memory controller design being optimized for FSB architectures. Again, the problem goes away with Sandy Bridge, but today we’re faced with it. Like Lynnfield, Clarkdale uses Intel’s LGA-1156 socket. Clarkdale should work in all P55 motherboards, but you’ll need a BIOS update. No existing P55 motherboards route video from the socket to a VGA/DVI/HDMI connector, so you’ll need a new motherboard if you want to take advantage of the on-package graphics. 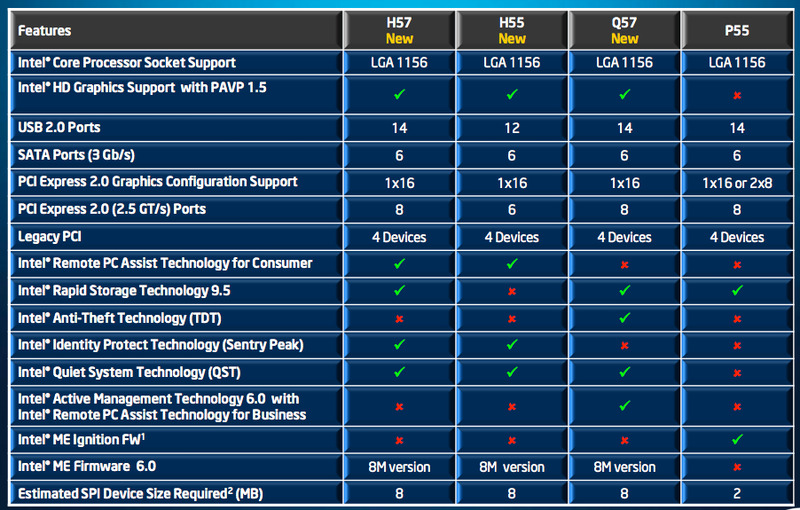 Enter the H55, H57 and Q57 chipsets. The H and Q-series of chipsets feature what Intel calls its Flexible Display Interface (FDI). This is basically a link between the CPU and the chipset that passes along video output. 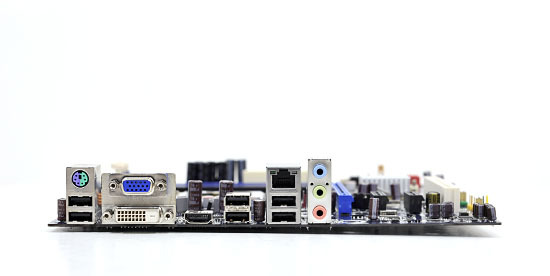 H5x/Q57 motherboards will have a video out on board so you can use Clarkdale’s integrated graphics. Support for Intel’s Rapid Storage Technology is probably the main reason you’ll want H57 over H55. The difference between H57 and Q57 boils down to security and management features. The H-series is for consumers, the Q-series is for corporate customers. Make sense? 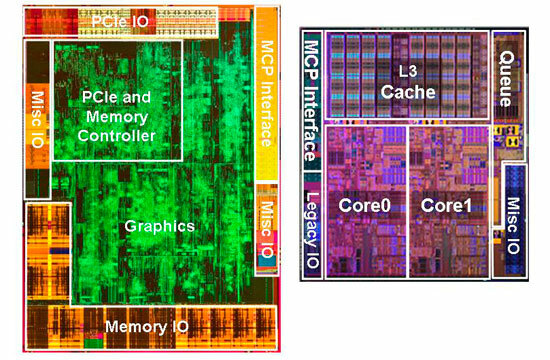 The six processors labeled Core i5s and Core i3s all have the same basic architecture. You get per-core 256KB private L2s and you get a 4MB L3 cache shared among both cores (down from 8MB from the quad-core Lynnfield/Bloomfield chips). The i5s get turbo mode while the i3s do not. The i5-661 uses a higher graphics clock and has a higher TDP than the 660. Remember that these are CPU+GPU combos on a single package, so GPU clocks do vary based on model. The Clarkdale lineup is honestly made up of CPUs that are too expensive. The Core i5 670, 661/660 and 650 are all priced above $170 and aren’t worth the money. The problem is Lynnfield’s turbo mode gives you high enough clock speeds with two threads that there’s no need to consider a dual-core processor. You can buy a Core i5 750, have more cores than any of these Clarkdales and run at close enough to the same frequencies for $196. 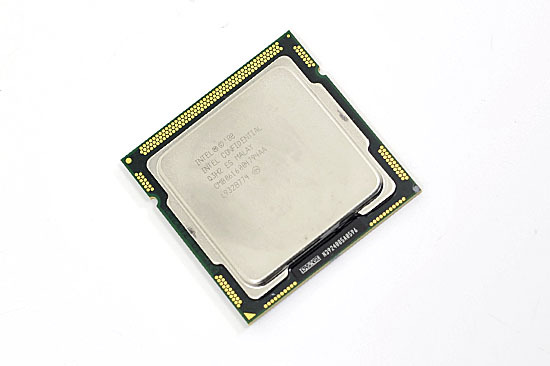 Or you can buy a Phenom II X4 965 for about the same price and have much better multi-threaded performance. The chips that are most interesting are the Core i3s. Turbo just isn't as interesting with only two cores. With four cores you used to have to make a tradeoff between good 4 and 2 threaded performance, but Lynnfield fixed that. No one really debates single vs. dual core anymore. The single core turbo modes are great, but aren't worth the money. Pay attention to the i3s. I've been building systems since the late 90's, mostly for others, and I'm always the last to get a decent system so I decided it was about time for me. I'm running an e6600 on a 3 yr old Intel board w/ 2g of DDR2 RAM and was wondering about the differences between C 2 quad, i3-540, i5-750 or i7-820. I priced out 3 different setups with Gigabyte boards (EP45, H57 & P55 - USB3 ver.) combined with Q8400/9300/9400 on EP45, i3-540,i5-750 and i7-820 on the H57 & P55 and 4 Gb DDR3 RAM (Crucial, Geil, Kingston)so , basically, I had 9 combinations. Excluding the i7, the price range for these builds was about $429 - $487, and I could probably do better if I tried but I was amazed that they were that close (the i7 adds another $100 but not that much improvement in performance that I can see). Looking at your charts, I think I can justify going with the i5-750. I have a decent video card for the occassional gaming that works pretty good for me now (I'll apply the $100 from above to a better card later) but I do a lot of spreadsheets and some photoshop and autocad so I think I'll see a better improvement there. I too am puzzled by the i7 870 scoring so low on the World of Warcraft chart -- it stood out to me immediately when I first read the article. I was a little surprised to not see it mentioned. at 1080p/24 correct. The nvidia 9400 chipset works at 1080p/24. So i've traded audio for skipping. Previous Intel IGPs managed achieve less terrible numbers in game by cheating- they didn't render all the polygons and textures. So for good measure i require side by side screenshots of the "new, better, faster and cheaper" Intel IGP. Why isn't the i7-860 tested in the section "Windows 7 Application Performance"? Without the i7-860 in the Windows 7 test section, this review is pointless. I was hoping to build a new always-on home server around one of these. Power miserly IGP and idle operation (for when it's only firewalling and routing) but plenty of grunt in reserve for occasional video encoding, compiling and running virtual machines. Looks like they missed the mark for this application, and I couldn't even adopt now and wait for the real deal CPU later, as the socket is a dead end. Ive seen gaming benchmarks on anandtech where the x3 720 matched the x4 965 when they are both overclocked to 3.8ghz. I was able to buy an x3 720 for only a 110 usd recently. So why isnt it in the benchmark comparisons?